« Is that router you want for the holidays ready for IPv6? All my ripped music is now mp3, as I discovered long ago that almost all devices supported this format. 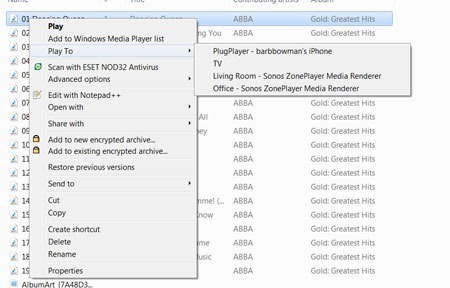 Clearly, Windows 7 can now stream music to my iPxxx devices. My individual jpg image files also presented no problems. Playing a picture stream to my iPad (did not try the iPhone) sort of worked. A sort of intermediary screen was displayed on the iPad with a button labeled “Done” after each image displayed. I could either wait and the next image would display or push this button to see the next image. So this needs some work or tweaking. Video, on the other hand, was tough. Neither dvr-ms or wtv are apparently supported by my iPxx devices/Plug Player and it appeared that while mp4 files work, there is no buffered instant play and you need to wait for the whole file to be loaded in memory. So, small video files are do-able, but I don’t see any transcoding taking place or any live streaming. I couldn’t get a small mp4 video file (about 1/3 Gig) to actually play without intervention. For proof of concept I took an old unprotected dvr-ms and converted in to a mp4. I suspect the file was transferring in the background and being cached locally on the device. I actually closed the Play To window on the computer. Five minutes it showed up on the device on a Playlist screen, where I could push the play button and watch the video clip. 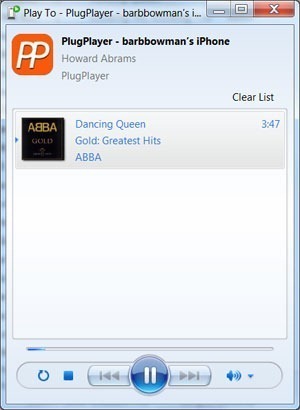 My conclusions – the existing PlugPlayer app is fine for music streaming using Windows 7 Play To, but not so good for images and videos. 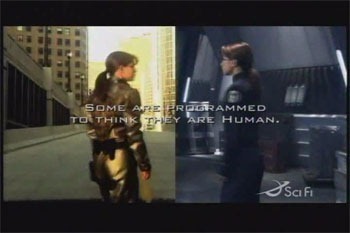 Still, there is now proof that it is possible to Play To an iPxx device, which opens up possibilities. I may post a message on the PlugPlayer support forum and see if the developer is interested in pursuing these issue. If you have experience with this app, suggestions for other DLNA controller iPxx that are better, or comments in general, please post on the DLNA forum on The Green Button.